He described the American Well telehealth enterprising system as a “fully-branded, white-labeled” system, which means that someone viewing a facility's telehealth page does not see the American Well logo and instead sees the facility's own brand. Bagley gave an overview of a patient hoping to have a virtual consultation with a physician using the telehealth system. A new patient can sign up and input their information including demographics and insurance plan. They are then automatically enrolled into the facility’s EMR system. If the patient is already a part of the system, they can view their clinical history, schedule visits and receive notifications, and also talk to a doctor. Once they are inside the virtual “waiting room”, they can see when the physician pulled up their information and also how long it might take for the physician to begin the consultation. When the consultation is over, the patient will see a wrap-up screen that shows the information the physician collected during the visit, such as diagnosis, medication and allergies. The image above illustrates the consultation from a physician’s point of view. 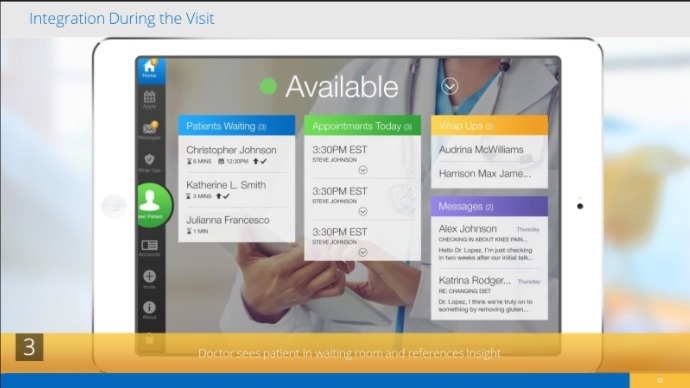 The doctor can view the patients who are in the waiting room, and if they click on a patient’s name, they see the patient’s information — which was gathered from the EMR — or note the reason for the visit. “It means using interfacing to bring appropriate information into the telehealth platform to facilitate an effective and meaningful visit, and then being able to share the uniquely-generated data from that visit with the [facility’s] clinical systems of records,” Bagley said. Another way to utilize American Well’s telehealth system is through provider-or-staff-initiated scheduled visits, according to Bagley, such as a patient going to a hospital and learning that their follow-up could be conducted via telehealth. The assistant at the front desk could set up an appointment, and then through email or a mobile app, notify the patient on the day of the appointment, where the patient is automatically entered into the waiting room. “Working with over 170 different health plans and health systems clients, with all of their own challenges and their own opportunities, we’ve been able to develop our products to work in any clinical setting and support most any service lines,” he said.